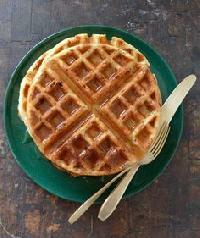 Whole wheat pastry flour allows you to bake with whole grain in familiar recipes that call for white flour. The complex carbohydrates, bran, B vitamins, and minerals of whole grains remain intact. The lighter texture of pastry flour behaves more like all-purpose flour in most recipes. One-third cup of whole wheat pastry flour provides 110 calories, 23 g carbohydrate, 4 g protein, 0.5 g fat, 3 g dietary fiber, 90 mg potassium, 20 mg calcium, and 1.08 mg iron. Wild rice is not really rice, although it is a close relative. It is a grass that grows in shallow water and is native to North America. A related species is native to Manchuria, in China. Cooked wild rice has a unique flavor and texture. It is high in protein and fiber, and it is gluten-free. Wild rice provides the B vitamins thiamine, niacin, and riboflavin, and the minerals potassium and phosphorus. One cup of cooked wild rice provides 166 calories, 35 g carbohydrate, 6.5 g protein, 0.6 g fat, 3 g dietary fiber, and 42.6 mcg folic acid. Greek-style yogurt is strained to reduce the whey, making it creamier in texture without adding extra fat. This yogurt is also more stable as a cooking ingredient because it is less likely to curdle when heated. Per serving, there is more protein and less carbohydrate in Greek-style yogurt than in standard yogurts. Because of the reduced carbohydrates, there is more �room� in your carbohydrate count to eat fresh fruit with it. Definitely stick with the low-fat option�the whole-milk version has 20 grams of fat per serving! One cup of nonfat plain Greek-style yogurt provides 120 calories, 7 g carbohydrate, 22 g protein, 0 g fat, 0 g dietary fiber, 70 mg sodium, and 200 mg calcium. A recent study found that calcium from dairy foods (1000 to 1400 milligrams per day) changes the way the body burns fat, increasing the metabolism of fat. This helps explain how skim milk not only provides sound nutrition, but may also help you lose weight. Fat-free milk is high in protein, calcium, and the B vitamins, including B12. If you are still drinking whole milk, switching to nonfat milk can be a significant move toward healthier living all by itself. Not only will you cut fat intake and calories, but you�ll get more protein and vitamins in place of the fat. 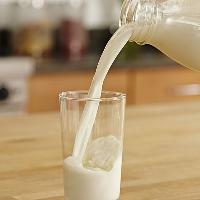 Start by switching from whole milk to 2 percent, then to 1 percent, and finally to skim milk. One cup of skim milk provides 86 calories, 12 g carbohydrate, 8 g protein, 0.5 g fat, 0 g dietary fiber, 500 IU vitamin A, 1 mcg vitamin B12, 0.2 mg niacin, 1 mg pantothenic acid, 0.4 mg riboflavin, 3 mcg vitamin D, 302 mg calcium, 103 mg sodium, 247 mg phosphorus, and 382 mg potassium. Inulin in yogurt adds thickness and provides extra sweetness and fiber. Without inulin, most yogurt provides no fiber. Live yogurt cultures that are often present in yogurt with inulin act as prebiotics and probiotics to promote digestive tract health and strengthen your immune system. Six ounces of vanilla low-fat yogurt with inulin provides 130 calories, 22 g carbohydrate, 7 g protein, 1.5 g fat, 7 g dietary fiber, 105 mg sodium, and 300 mg calcium. Cottage cheese is Little Miss Muffet�s meal of curds and whey; it gets its name because it was often made at home, from milk that had already had some of its cream skimmed off for butter. As a result, it has long been made in skim and low-fat versions. It qualifies as a SuperFood because it concentrates the protein and other nutrients from milk but is low in fat. Cottage cheese is made by adding a starter culture to the milk that causes it to separate. Most of the watery whey is drained off, leaving the curds, which are high in protein and calcium. Large-curd cottage cheese also contains rennet; the smallcurd version does not. Some low-fat cottage cheese includes active cultures like those in yogurt. These active cultures help digest lactose, making this cottage cheese a better option for people who have some degree of lactose intolerance. The active cultures may also make the calcium it provides easier for your body to absorb. One-half cup of low-fat cottage cheese provides 100 calories, 4 g carbohydrate, 13 g protein, 2.5 g fat, 0 g dietary fiber, 200 IU vitamin A, 100 mg calcium, and 390 mg sodium. Kefir is a cultured or fermented milk beverage from the Caucasus region of Central Asia. The cultures are called �kefir grains� and include a mix of bacteria and yeasts. It takes kefir grains to make kefir grains, much like the sourdough starter process for bread. There are different strains and types of kefir grains, which give different qualities and health Benefits to the beverage. Traditional kefir also has a low alcohol content. Kefir�s cultures are believed to help strengthen the immune system. They also make the milk more digestible for those with lactose intolerance. The �friendly� bacteria and yeast (and the alcohol) help eliminate more dangerous bacteria from the system. They may also encourage anti-cancer compounds and have been used to soothe skin disorders. One cup of plain low-fat kefir provides 120 calories, 12 g carbohydrate, 14 g protein, 2 g fat, 3 g dietary fiber, 500 IU vitamin A, 2.4 mg vitamin C, 100 IU vitamin D, 125 mg sodium, and 300 mg calcium. Plain low-fat yogurt is a staple in healthy meal plans. 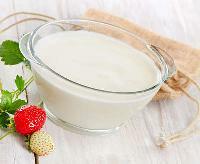 The cultures in yogurt appear to support intestinal health and improve immune function. Low-fat yogurt is a very satisfying food and a good source of protein, calcium, and the B vitamins. Eight ounces of plain nonfat yogurt provides 130 calories, 19 g carbohydrate, 13 g protein, 0 g fat, 0 g dietary fiber, 550 mg potassium, 170 mg sodium, 350 mg phosphorus, and 450 mg calcium. Soy milk is low in carbohydrates, so you can eat it with your cereal without adding to your carbs. It�s also low in fat and an excellent source of calcium. Soy milk is a great way to add the Benefits of soy to your diet, reduce reliance on animal products, and possibly help lower cholesterol. As a milk replacement, soy milk is also supplemented with some vitamins and minerals to provide a more milk-like nutritional profile. One cup of unsweetened soy milk provides 70 calories, 3 g carbohydrate, 7 g protein, 3.5 g fat, 1 g dietary fiber, 750 IU vitamin A, 120 IU vitamin D, 0.51 mg riboflavin, 3 mcg vitamin B12, 70 mg sodium, 300 mg potassium, 300 mg calcium, and 1.8 mg iron.